Live chat usage continues to grow year after year by companies across all verticals around the world. The effectiveness of this real-time communication channel makes it a smart choice for businesses while providing an engaging experience to web visitors. If your company doesn’t offer live chat today and is looking to expand into this medium, you may not know where to start. 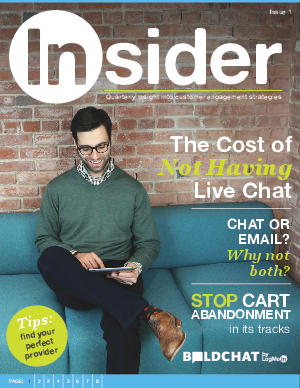 This quarterly insight into customer engagement strategy focuses on the cost of not having live chat, 5 points to consider for Live Chat and also provides the 3 key takeaways for businesses to consider when trying to reduce cart abandonment.